shuttle and military satellites now spy on North Korea. Chapter 4 describes how India's Vikram Sarabhai developed a sounding rocket program in the 1960s. Modeling their own rocket on the American Scout launcher, India eventually put a satellite into orbit in 1980. The following chapter describes the expansion of the Indian space program. Chapter 6 relates how the Indian space program is looking ahead to the success of the moon probe Chandrayan, due to launch in 2008, and its first manned launching in 2014. Chapters 7, 8, and 9 demonstrate how, in Iran, communications and remote sensing drive space technology. The new Islamic Republic abandoned most of the Shah's space and nuclear plans. Iranian work on satellites and rocketry was started in the mid-1990's. Indigenous technology combined with foreign help should eventually lead to a thriving, independent Iranian space program. Chapter 10 outlines Brazil's road to space, begun in the mid-1960's with the launch of the Sonda sounding rockets. The following two chapters describe Brazil's satellites and space launch systems and plans for the future. Chapters 13 and 14 study Israel's space industry. Israel is developing spacecraft (with some European cooperation) and launchers (with South Africa and USA). In 1988, Israel became the ninth country in the world to successfully launch a satellite (Ofeq-1) with its own vehicle (Shavit). The next chapters look at the burgeoning space programs of North and South Korea. South Korea aims to become a major international player in both space systems and in manned ventures. Launch vehicles are being developed with Russian help while European partners are aiding with the production of advanced remote sensing satellites. 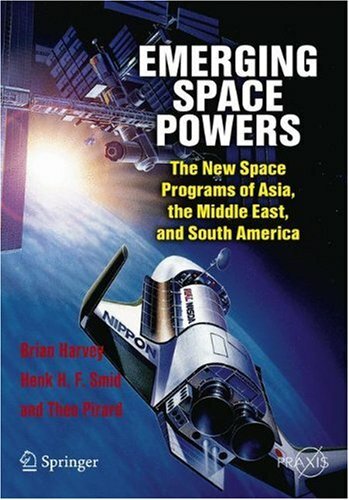 The book ends with a chapter contrasting and comparing all the space programs, and speculating how they may evolve in the future. An appendix lists all launches and launch attempts to date of the emerging space powers.